In 1989, Francis Fukuyama famously announced the "end of history." The Berlin Wall had fallen; liberal democracy had won out. But what of illiberal democracy--the idea that popular majorities, working through the democratic process, might reject gender equality, religious freedoms, and other norms that Western democracies take for granted? Nowhere have such considerations become more relevant than in the Middle East, where the uprisings of 2011 swept the Muslim Brotherhood and other Islamist groups to power. 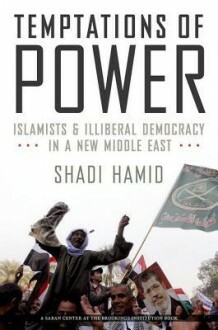 In Temptations of Power, Shadi Hamid draws on hundreds of interviews with leaders and activists from across the region to advance a new understanding of how Islamist movements change over time. He puts forward the bold thesis that repression "forced" Islamists to moderate their politics, work in coalitions, de-emphasize Islamic law, and set aside the dream of an Islamic state. Meanwhile, democratic openings in the 1980s--and again during the Arab Spring--pushed Islamists back toward their original conservatism. With the uprisings of 2011, Islamists found themselves in an enviable position, but one for which they were unprepared. Groups like the Brotherhood combine the features of both political parties and religious movements, leading to an inherent tension they have struggled to resolve. However pragmatic they may be, their ultimate goal remains the Islamization of society. When the electorate they represent is conservative as well, they can push their own form of illiberal democracy while insisting they are carrying out the popular will. This can lead to overreach and significant backlash. Yet, while the Egyptian coup and the subsequent crackdown were a devastating blow for the Islamist "project," obituaries of political Islam are premature.As long as the battle over the role of religion in public life continues, Islamist parties in countries as diverse as Egypt, Tunisia, and Jordan will remain an important force whether in the ranks of opposition or the halls of power. But what are the key factors driving their evolution? A timely and provocative reassessment, Hamid's account serves as an essential compass for those trying to understand where the region's varied Islamist groups have come from and where they might be headed.